Understanding formality is a cornerstone of dressing well. Only when you understand that flannel is more casual than worsted, and a derby more casual than an oxford, can you begin to understand the impression clothes create - and how to put appropriate things together. Basically, formal clothes are dark, subtle and sleek. The more going on, the less formal a piece is. But can we assess the formality of a whole outfit? Can we construct some kind of scale? A reader asked this question recently, and I think it might be useful to try. It would enable us to do many things, for example rate each other, and consider that a certain ‘rating’ of formality would be appropriate to a certain event, or certain office. There will always be many exceptions and caveats, but it would remain a useful (if rough) tool. Many things contribute to the formality of an outfit. We will concentrate on the most important aspects of the most important clothes: the colour and material of the jacket and trousers. But other things can combine to move any outfit up or down the scale. How you wear things makes a difference - if something is sloppily made, or doesn’t fit, it is likely to be undermined. We won’t even touch on that. Ideas of formality can be culturally specific. Americans see black tie as a quintessential wedding outfit, for example, where Europeans do not. Some cultural associations can make things seem more formal. A pinstripe suit, for example, could be seen as more formal because of its association with business, than a plain one. Generally, these associations are recognised enough to be easily taken into consideration. With those in mind, let’s go. There are of course more formal things than black tie, but for most people this is as formal as it gets. It is today’s formal evening wear. A lack of colour and a contrast in textures rather than patterns makes black tie the most subtle and formal of ensembles. The above example is a particular formal example, given it is worn with a wing collar. But it is soft-shouldered, so not quite 1.1 (the highest rating). I'm going for 1.2. The next most formal outfit is a worsted suit - the traditional business wear of much of the past century, but fast becoming formal wear. It is formal because it is made in a single cloth of a single colour, and because its worsted yarn (the wool) and finish make it smooth and sleek. There is huge variation in the category, between plain navy and a loudly checked brown worsted, but we will have to let those slide if we are to keep this scale manageable. I would probably also allow flannel into this category, given it is likely to be plain and grey, even though it is a woollen not a worsted (and therefore has greater texture). Above outfit: 2.6. It's a pretty informal colour, but is worn with a tie and formal shoes. Once the jacket and trousers are of a different material, the outfit is immediately more casual. 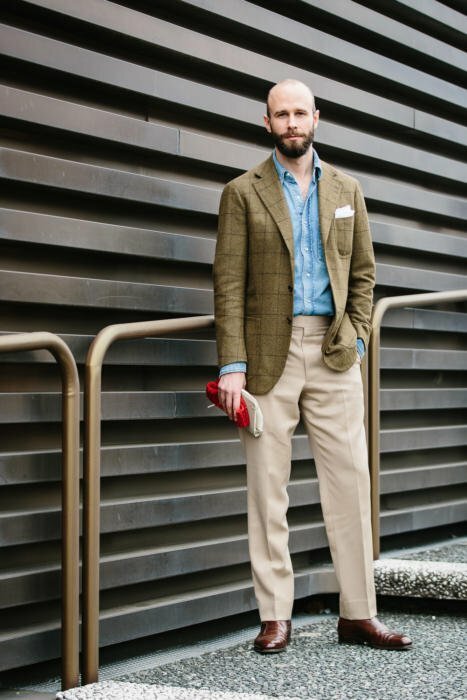 But it can still be smart: the classic is a navy blazer (in hopsack or cashmere perhaps) and grey trousers (in contrasting texture, so maybe flannel with the hopsack). I would allow into this category anything where the materials of the two pieces are relatively subtle and simple. Such as light-grey jacket and dark-green trousers, for instance. Above: Perhaps a 3.3. Formal because of the tie and handkerchief, only informal element being the texture of the tie. This is a relatively broad category in one sense: it takes it every material from tweed to linen to cotton, and every colour and pattern imaginable. But it is also a narrow category, in that it is rarely employed. Few people wear casual or ‘knockabout’ suits today. The cord suit above: 4.3. Has a tie and clean white hank, but tie is wool and shirt is denim. By ‘smart trousers’ read anything except jeans (any very casual, washed chinos perhaps). 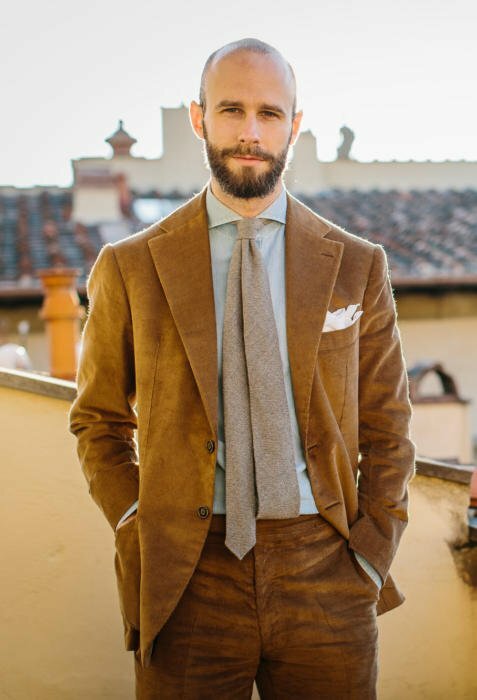 So this category includes a brown cashmere jacket with pale flannel trousers, a green herringbone jacket with tan cavalry twills, and lightweight wool jacket with cream linen trousers. There will be a wide disparity within it, depending again on the strength of colour, prominence of pattern and so on (see list of variables at top). But it is a cohesive category, and one which many more men wear to the office - and find it hard to put together. Above: The cowboy shirt and lack of tie brings this way down the spectrum, to 5.7. Primarily, stuff with jeans. 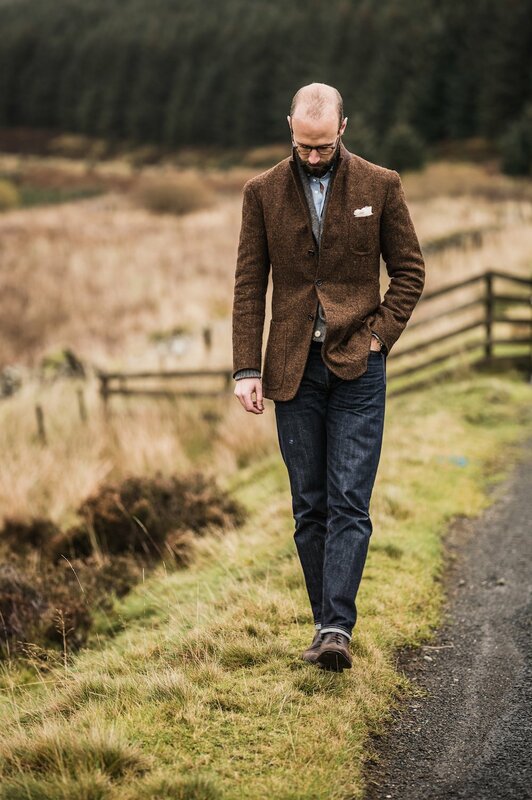 It might be a tweed bespoke jacket, it might be a washed-cotton RTW jacket (think Boglioli), but the top half is likely to be soft and unstructured, to go with the casualness of the trouser. I might also allow into this category things like Teba jackets, sweater jackets and so on. The very presence of a jacket rather than knitwear or just a shirt immediately raises an outfit up the scale. Without that jacket, we’re into a large and amorphous last category. If we assume something is worn over the shirt or T-shirt on top, then this is best thought of as the knitwear category. It has almost bottomless things below it, down to a T-shirt, shorts and flip flops. But few people care by that point, so we will stop here. The primary thing that makes a difference to wear an outfit sits in each category is probably the tie. Wear it with the casual jacket and smart trousers, and you’re immediately at the top of category 5. And the second is probably shoes. The formality of category 6 is transformed if you wear polished derbies with the jeans rather than beat-up trainers. These points also demonstrate that the categories could possibly overlap. Adding that tie to category 5 may push you above many things in cat 4. But the absolute formality of each category. They represent a constant that can be achieved in different ways. So how would you rate what you're wearing today? And those in your office around you? You can follow the discussion on Seven levels of formality by entering your email address in the box below. You will then receive an email every time a new comment is added. These will also contain a link to a page where you can stop the alerts, and remove all of your related data from the site. As I am 26 and PhD student, I don’t have many occasions to be formal at levels from 1 to 3. I usually sit between 4 and 7. In FW I really like cav. 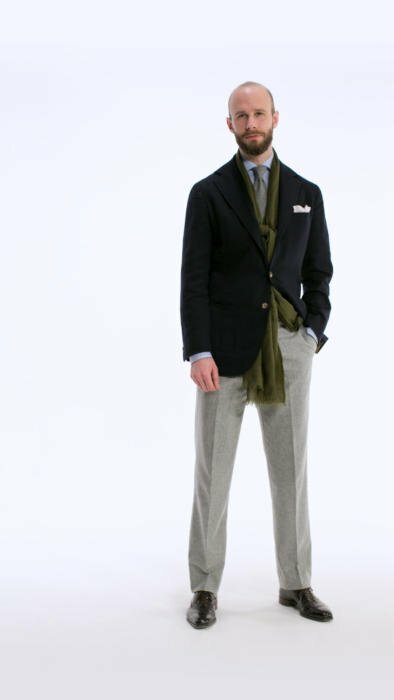 twill trousers or flannel ones with tweed jackets (my favorite cloth), while in summertime I go for Crispaire like cloth or cotton trousers with linen/silk/wool mix sport coat. This spring I really liked the Mesh Blazers Bunch from Holland & Sherry so I pick a royal blue for a golden buttons blazer (2 buttons). Love it. I must admit though, all I want is more features on “knockabout” suits!! I am thinking of having a tweed suit made with v soft shoulders, patch pockets and relatively high waisted pleated trousers. I hope that I could wear it as separates or all together as an informal weekend suit (with or without tie). Would love your thoughts Simon!!! Knock about suits cover a wider range on the ‘formality scale’. More articles in that would be good . Couldn’t agree more. I live in these things and they are way more versatile than credited here. The suit featured would work everywhere except on the most formal occasions and paring it with a polo, a sweater (roll neck or V) and loosing the tie would make it more louche. This is the future for suits and we need more commissions to see how the different tailors approach the opportunity. First off, thank you for setting up the institution that your blog is. I have read almost every article since you first began and the blog has been immeasurably helpful. This may seem an unrelated question but I have been vacillating on the rise of my trousers. I currently wear my dress trousers half an inch below my navel but I keep changing my mind whenever I make something new at my tailor. I want to ask how many inches above or below the navel is your typical dress trouser. Keep in mind that I want to preserve a formal classic silhouette. You have two options really: on the natural waist (where it sounds like you currently are) or on the hips. You can have various options in between with braces, but not really without. Would be interesting to learn how the ‘rise’ is measured. Whilst up to the navel or hips answers one point how far should the ‘drop’ be? Would they measure to lowest part of the ….ermm… ‘family jewels’. How do tailors get this right ? Particularly if you’re wearing very ill fitting trousers . Having once ordered a pair of MTM trousers from an online tailor (before my reading PS days) this was the most difficult measurement to do. As a result of which the trousers were pretty nonwearable. If I were to order MTM trousers I would take the measurements from a pair of trousers that already fit me well. I’ve gone that route for MTM shirts and the results have been good. One question comes to my mind. Why morning coat, if it’s that formal, has separate trousers to go with? Originally suits (same cloth used both in the jacket and trousers) were intended to be worn in informal ocassions. The thing has completely turned around. Wing collar shirts are for white tie. Please don’t wear them with black tie. You’re right, it was more a request to readers as a whole, rather than you specifically. We have covered this on black tie posts in the past. A wing collar with black tie is rare and unusual, but not wrong. 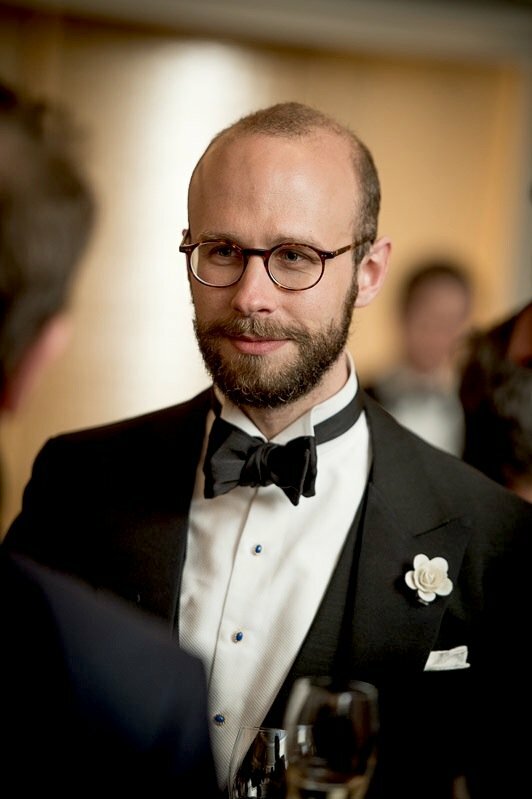 I would still recommend people to generally wear a turn-down collar with black tie though, as I do largely as well. Ha, good question. I’m wearing a navy birdseye worsted, white shirt, black shoes, burgundy tie and white pocket handkerchief folded into a square. I’d class myself as a 3 rather than a 2, because the shirt has single rather than double cuffs and a dressy item like a pocket square is inherently less formal. As for the people around me…. where would a crumpled shiny black or navy suit, scuffed tans shoes and white shirt worn without a tie fall on your scale? Funnily enough it’s usually only the ladies in the office who don’t turn up each morning looking like the spent the night sleeping in the back of their cars in the parking lot. since you’re asking what’s my formality level today – I don’t know where to fit on your scale because you don’t include a suit without a tie. so, brown linen suit, blue denim shirt, navy suede loafers, where is that on the scale? how come it’s missing – just an oversight or you don’t wear/recommend tieless suits? As mentioned towards the end, whether you wear a tie or not is an additional variable (like shoes) that alters where you fit in to each category. that is to say that the distinction between formal and casual is highly dependent on context (and I think you do touch on this idea as well) – but an absolute reference, like you provide in this article is indeed interesting and useful. I’m wearing a navy blazer with brown trousers, check shirt, solid blue tie, black oxfords and a pocket square. I’d say I’m at a 3.2 given the checked shirt and pocket square but you could rate it higher given the formal shoes (maybe a 3.5). In my office and society (Canada) this is quite formal. The suit without a tie is very common, as are chinos or jeans with sport coats. Although the formality of clothing usually increases as you go up the hierarchy of the organization. I’m temporarily working in an old building with poor air conditioning. As it warms up things will get less formal – linen shirts, a loosely woven cotton blazer or airy sport coat, loafers, chinos, linen trousers . And on very hot days no tie. A very interesting and helpful article. I think I am 8-9 (check shirt, navy chinos, navy nubuck derby brogues no jacket or knitwear) but then I am working from home and it is rather sunny. I am definitely the most formally dressed in the home office – neither of the hounds have made an effort. Surely the hounds will at least have coats on. I find discussions on formality of clothing interesting as it differs across cultures. I think (but could be wrong) that these distinctions are more finely parsed in the UK than in my country of Canada. In the US the distinctions are stronger than in Canada – maybe due to the tradition of linen, seersucker and other fabrics in summer. Especially in cities like Washington, D.C where the weather is very hot and muggy in summer. The office may be air conditioned but step outside for just 5 minutes and you will be sweating profusely, especially if you are a Canadian going to meetings in your “all season” worsted wool suit. When meeting international clients it’s interesting to see how they view formality. I’ve noticed Japanese officials becoming less formal (in their terms) with lighter coloured suits becoming more prominent. And a certain, subtle, sartorial flair. Chinese officials still favor dark suits and white shirts. Ha. I’ve been working from home today so would put myself on the extreme casual side. Even wearing a pair of Albam chinos that I picked up many years ago when you first used to talk about them, Simon! Would also love to see more posts on knockabout suits. An interesting post I dont usually think much about the formality when choosing an outfit but on reflection I was alot more formal than normal today. I was so cold yesterday (shivering) in London that I put on my 16oz winter flannel navy chalk stripe double breasted today. I toned it down a bit with a check shirt and wool tie so I am going to guess 2.4 for formality and a lot more warm and toasty walking about town today. Thank you so much for this post! To my mind, this is the first post ever published that attempts to work out a useful formality scale of today’s menswear outfits. I hope this post reflects a work in progress and hence would be followed up with a book, which could then allow you to expand more on the various levels while using more pics to remain useful. Whether it’s clear to most readers or not, the truth of the matter is, a sort of understanding of such a formality scale is actually assumed every morning or when it comes to buying new items. And alas, such an understanding could be completly misguided! Indeed, how we relate items to time, occasion and purpose, or even how we consider an item as versatile or not highly hinge on such a rationale. The Financial implication is therefore really huge! 1. Aren’t there knockabout suits whose formality would be higher than the navy blazer / tie / light grey trousers combo? 2. Could a tie (and a shirt perhaps) substantially move the level of the outfit depicted as 5.7? Thanks for your reply! Do you have a favourite bespoke shirtmaker in London for lower prices? Who is the Graham Browne of shirts? Not sure what she’ll charge exactly but you could do worse than talking to Deema Abi-Chahine on Brewer Street in Soho about what she’d charge. I’ve not bought from her (yet) but I know that both she and her colleague Antonia (Montague Ede) are a bit more affordable than the big names. Both are producing beautiful stuff too. Interested in any other experiences of Soho tailors / alterations. Have you ever used Raffaele Candilio, or have anyone else to recommend? No – afraid not – aside from a disaster with an outfit in SE London Antonia is only my second bite at bespoke but the outcome was fabulous (and has attracted a lot of comment whenever I’ve worn it). Would be more than happy to share pics with Simon if interested. Thank you Simon for a very useful hierarchy of dress. I couldn’t help make the connection between the title of this post and John Ruskin’s Seven Lamps of Architecture, where he details the leading principles of architecture into 7 elements. It’s quite a good read if you have the time. Having thought about it, there’s a lot of similarity between the design of a building and the design of an outfit, both need to perform a particular purpose and have to fit into their surrounds. I took the title to be a nod to William Empson’s “Seven Types of Ambiguity”. Of interest is where country wear fits, as you know this ranges from suits to moleskin trousers and a shirt (usually Tattersall). But the outdoor nature and heavier cloth adds a further layer of ‘casuality’. When considering (for fun) this type of taxonomy I would add (in order); weekend casual, athleisure (aka technical wear), specific work wear, activity inspired wear (biker jacket), sports and beach wear, sleepwear (though some dressing gowns can be beautifully tailored) . The guiding notion, perhaps, being levels of acceptability in social situations. These are the sorts of posts that I read over and over and their value cannot be underestimated. If PS has taught me anything, it is to be constantly mindful of the “sliding scale of formality,” and how it relates to my own tribes, both at work and in my personal life. And, yeah, the knockabout suit needs its own post. Brilliant article. Most of these styles mentioned above have always seemed fluid to me. You might wear a soft constructed worsted tan suit and it might seem on the same level as a smart blazer/trouser or even a category 2-3. You could even dress up or down a blazer as with tie and shoes as you mentioned. But it puts the styles into better perspective to see a structured category for dressing. 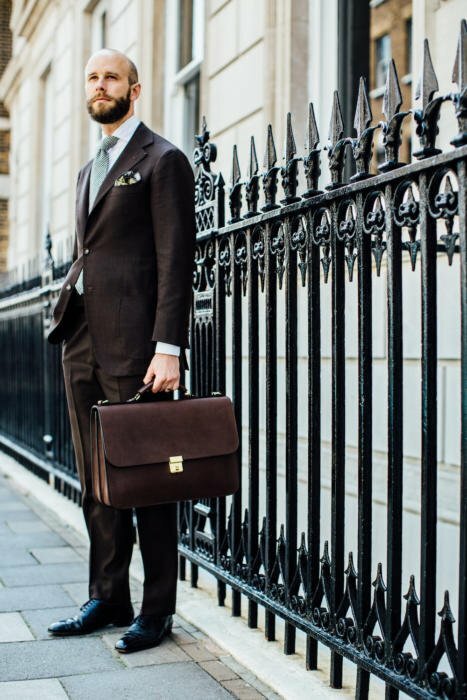 My go to summer suit for most occasions (even formal but not black tie) would be a bespoke brown, tea-with-milk coloured suit in worsted H&S CoolBreeze with structured shoulders, tie and burgundy brogue oxfords . Even though I have a charcoal grey suit, I find that the brown gives a softer look on me yet not too casual with the structured shoulders. How would you rate something like that in your formality scale? Still in casual suit 4-5 or worsted suit/smart blazer category 3? One offtopic question about neapolitan jackets. 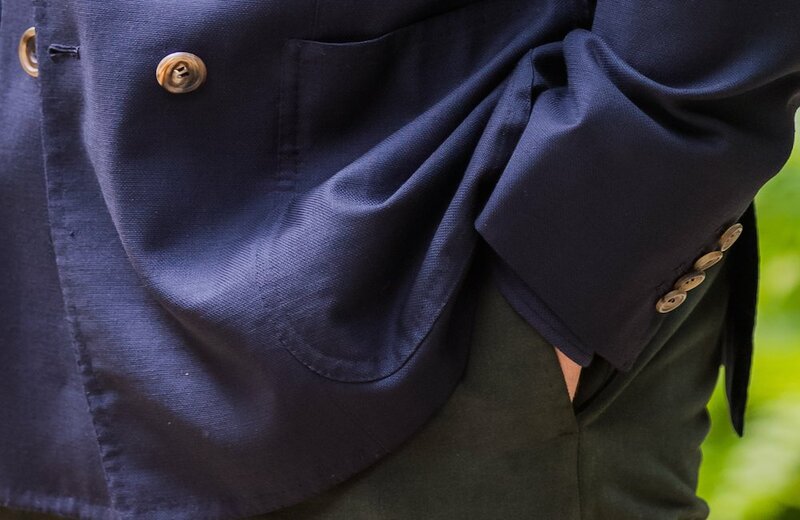 Those jackets with one button on the sleeve, is this button the same size as the the ones when the jacket has 3 or 4 buttons? If not, what is his size? I want to source my own buttons for giving it to my tailor and I don’t want to be wrong. It would be interesting to connect these levels of formality to particluar jobs, or situations. Wearing beautiful clothes in the wrong context can be serious error. I’m a lecturer at a university and don’t think I could go above level 4 without looking unbearably pompous, and, I suspect discomfitting my students. I knew a teach once who was very dressy, wore handmade suits for his classes, even sported a bowler on occasion. His students complained, saying the way he dressed made them feel nervous. I love formal clothes and would like to build up a collection of bespoke suits such as have been presented on this site, but sadly, it would be a terrible waste of money, as they would almost never be worn. I simply don’t have the lifestyle. Thank you for this extremely helpful, specific and wise insight about levels of dress. The grading scale is interesting, and I appreciate it is difficult to be exact with the decimals. It would be useful to see even more photos — perhaps close-ups to see contrasting textures, patterns, etc. On the whole, though, thanks for this breakthrough in categorization and understanding! All those photos are taken from other posts, so you can usually find them elsewhere on the site with more details. If I have time, I’ll go back through and add links to them all. Where would a Smart jacket with chinos sit in this spectrum, Simon? Sadly Phil raises an excellent point about society and the decline of dress codes (I’m not linking it to formality – just the ability to wear what you want without being regarded as a ‘stiff’ – in the American sense). Work, lifestyle, and aspects of social life (formal events, business events, dinners, cafe society, clubs etc.) dictate the various dress codes that we adhere to but as many of these codes are becoming less enforced suits and ties can become inappropriate. One source of this impact is from women; there is great pressure from UK women especially to loosen dress codes – parliamentary select committee hearings on the subject are an example of this. The dress codes of News presenters exemplify this; suits for men, colourful separates for women etc. I do not seek to blame but if 50% of the population seek less formality and as ‘office workwear’ is so poorly made it impacts on the overall aspect of formality for everyone. Great post, Simon, and this one could run and run. A couple of thoughts: formality of dress has to be related to the context in which it will be worn, so understanding and respecting that is important. People will judge what you are wearing against that context, and, rightly or (probably) wrongly, form opinions. The biggest challenge, though, will be where your personal starting point is. If your regular kit is casual trousers, open neck shirt and odd jacket, then going, perhaps rarely, to a “knockabout” suit and woollen tie could, for you, be a huge move up the formality scale, even if it is not so huge on the “Simon” scale. In these circumstances, going to Simon’s next level may be too overwhelming. I spend most of the working week in a full bespoke rig, so at the weekend when I default to 501s and a polo shirt I form a new scale, Slobbsville. On the wing collar issue, I really don’t think it is right for black tie, but if it is to be worn, it has to be detachable and starched. White tie is almost irrelevant these days, even in the grandest livery company setting. And when I see the “celebs” from sport and stage wearing a black necktie with a DJ, my instinct is to petition for the return of the birch. Interesting observation! This trend is a clear indication of a mere fact: many people are oblivious of the high stakes related to this issue! It’s really depressing, to say the least! Fantastic post Simon. +1 vote/request for more on casual suits. Do you ever wear 3-4 without a tie? And I believe you’ve mentioned before that you never wear a suit (no matter what kind) without a tie? 3.5 2.7 6.9 Are you associated with or related to Robt Parker? Most informative post, Simon, thank you. Never having thought to quantify all of this (relying on my eye instead) and considering my California habitat, I have probably lived in the 5-6 zone for some time. That written, I also self-deprecatingly refer to myself as “tragically over-dressed,” but the current style of dress in the sunshine state is another topic. Concerning chinos (e.g., khaki, tobacco) with less formal jackets, my vote is yes. 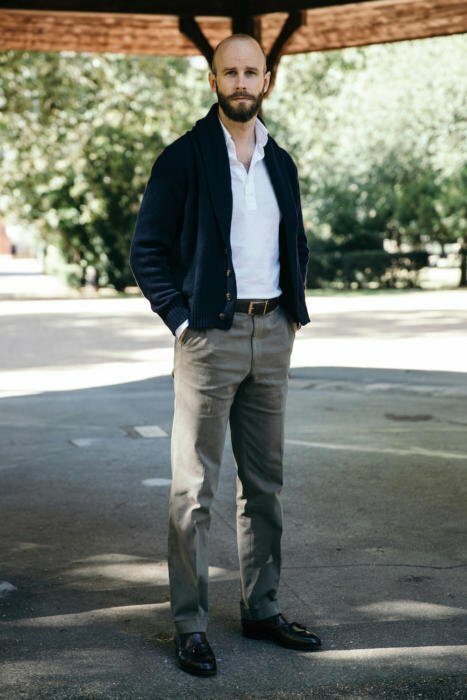 If you want to move it up the formality scale almost imperceptibly, consider having cotton chinos professionally pressed (flat) – certainly does not hold, but makes a subtle difference for a couple of wearings. Also, in the 5-6 category, wearing a merino, long-sleeved polo with formal trousers and adding a patterned, silk or silk/wool pocket square can push it toward 6. The combinations are infinite and details matter, but if I analyze what almost became a uniform, the mixture of textures (e.g., tweed and flannel) and balance of color were key – the more monochromatic (not literally, but conceptually), the more elegant. Looking back, I typically did not extend beyond two color palettes (e.g., charcoal grey and mid-brown) despite the many colors in tweeds and other jacket cloths as it tended to diminish the overall effect. The pocket square can certainly violate this guideline, but proceed with caution. So much for that. Thanks again, Simon, and would welcome your expert critique should you care to comment. When I was at university (in the early ’90s), a dinner invitation that read “Dress Informal” meant black tie; Sunday lunch was always an occasion for a tweed suit; and garden parties were either in morning dress (formal) or blazer and flannels/corduroys/cavalry twill (informal). My father thought me very scruffy for not having a frock coat, but his generation were stricter about these things. Oh, casual day wear was either a lounge suit, or a jacket and tie etc. American students often wore “jumpers and ties” but this was generally frowned upon for non-Americans. I am not wearing any clothes. Is that very formal or informal? I guess it depends whether one stands for the occasion. Is that 1-2 or more likely 6-9. (1) when I was away at school in England in the 90s, all events were listed with a dress code – literally a code! – that designated the formality level, and it was well understood by boys as young as 13 what this meant in terms of how they should dress (if not how they should behave!). I don’t know if my school, or others like it, still have these codes, but it’s interesting that such formulations have existed in the not-so-distant past and, for what it’s worth, pretty closely resembled your categorization. (2) I now live and work in the U.S., where I have encountered an entirely different phenomenon: the crossing over of categories. The most striking to me was the habit of wearing formal shoes – say a black calf Oxford – with informal trousers – washed chinos or jeans. To my eye, this mixing and matching of formality cues leads to a discordant overall appearance. Maybe his shifts the wearer into a parallel dress category (perhaps “badly dressed”? ), but I’d be interested in your thoughts of this in the general, less extreme, case. On the second point, I’d say that formality should be considered in the same way as all ‘rules’ in menswear. They should be carefully considered and respected, as they contain a lot of wisdom. But they can then be broken, once you understand the effect that will be created by doing so – as a result of understanding the rule in the first place. I don’t think your example sounds like a very effective breaking of the rules, but there can be some. I lived in New York for a couple of years and, business attire excepted, their typical approach to casual dress in unlike anything your would “expect” to see in Europe frankly. including shorts with ankle socks and sneakers!! I lived there for ten years and worked in the beauty business. Happily our work made us an island of style in an ocean of the unwashed. There is a reason The Trumpster dresses as he does. Give the average New York male a blue shiny suit that is two sizes too big, a white open neck shirt that has been pressed into submission, a pair of black loafers polished (by somebody else) to a glass finish and a computer bag and he’s ready to rock. If he’s a manager he may have a Hermes tie in his pocket that he will sport with the blade representing a third leg. Oh, and the haircut, don’t even go there! Is there a reference you can recommend that ranks the formality of various suit details? For example, peaked lapels are more formal than notch lapels…is there are reference that goes through each of the features of a suit and rates their formality? Great article and thought experiment – thanks Simon. As someone interested in reducing the amount of stuff I own, I’ve always been interested in what you might recommend for a very minimal capsule wardrobe (I’ve seen some pieces close to this but I’m thinking even more minimal than those articles). Assume a full 4-season climate and a business casual work environment (suits 5-10 times per year – mostly weddings and night events and a few business occasions; coat and odd trousers 5-6 times per month). I’m thinking in the range of narrowing down your wardrobe to 1-2 suits, 2-4 coats, and 4-5 trousers; what would they be? Goal of spanning multiple formalities/seasons and maximizing the versatility of every piece. Essentially, if you had to have a wardrobe, what would it be? Thanks so much. This does depend so much on lifestyle. When it comes to core pieces (business suits and formal overcoats), I pretty much did this when I retired from corporate life a few years ago. As leisure activities have expanded so has the associated wardrobe and that is the problem or opportunity – depending how you look at it. Whatever your situation, the key to keeping control of things and maximising your investment has to be to buy quality that suits your style and which you are going to wear a lot in colours that are completely co-ordinated. Then keep them for years. As Beau Brummell discovered, quality looks better with wear. Simon can you put cufflinks in the context of these rankings? I e heard it said they should only be worn with suits, but they can be so fun and personal it seems a shame to limit them to that, especially for those of us who are often more imformally dressed. I’d keep them for categories 1, 2 and 3 to honest. So with smart clothing, always with a tie too. Double cuffs are simply a very formal thing, nice as it is to have an excuse to wear jewellery. It’s interesting (and a bit of shame) just how unusual ties have become outside of finance or legal professions. The pocket square, on the other hand (which I wear every day) seems to have moved in to replace it. Is the tie destined to be gone for good…? In terms of formality, would you make any difference between chambray, denim and Oxford shirts? On a side note, is the shirt capsule post in the works yet? Yes, generally the rougher the cloth, greater variation in colour, and strength of colour, the more informal it is. So in general an oxford would be the most formal of the three, followed by chambray, followed by denim. Your concept of different levels of formality resonates a lot with my day to day job/life. This post helped me to dress more appropriately for every occasion and got me thinking about what actually is appropriate for the situation and how others dress for particular occasions. Having build a solid wardrobe of suits, jackets, trousers, shirt, shoes, etc so far, I would like now extend into watches. My goal is to find great pieces to match different levels of formality. 1) To which levels of formality would you match/wear which watch from your own collection? 2) What would be your guidance for choosing the right brand / price level? With shoes you recommend to buy the best we can afford, but I have a hard time to wear a watch, that costs 5x of everyones else…? I guess because a watch is more a symbol of status, isn’t it?? Thanks D, pleased it’s been helpful. Have you read my three posts on watches? Maybe do so and leave comments there with questions? Thanks for weighing in: Is there a universe in which an evening party’s designation of “semi-formal” could mean, say, flannel trousers and an odd jacket, if the rest of the formality was upheld, say, of the material of tie, white shirt, hank, shoes? Or must it always denote a suit? I suppose if nearly everyone else is in a suit, one would show up dressed differently at their peril. Trouble is, my one dark suit is a summery, high-twist navy, and was a cheap buy at the very onset of trying to dress better. I think that could work well Dan, but it’s entirely dependent on the society and expectations of everyone else. In the UK, for example, a navy blazer and trousers is much less normal and recognised than in the US. Look forward to watching that. I know what you mean; I consider the American navy-blazer-and-trousers look to be a generation above me, and dying out. I think the expectation is fairly low in terms of actual stylishness, as it’s a casual group who dress up only for project-end celebration. 98% of men will be in their “one suit,” black derby shoes, skinny lapels, etc. Was considering tweed jacket, flannels, dark brown semi-brougues, a nice tie, etc. Slightly Boyer-ish, if I were to aspire. Technically, I’d be dressed down, but sort of not, given nearly every partygoer wears hoodies, denim and t-shirts to work on any other day. Perhaps it’s risky, but there’s little protocol to trip one up socially in this corner of the US.